The huge piece of stone bearing these carvings lies partially hidden by the church yard wall. It’s almost certain that there are more stone carvings hiding in the church yard itself. Carvings of this nature mirror the bronze age religion, here with ships, cup marks and a chariot. The chariot is one of few known in all of Mälar Valley, but it is a common motif in other landscapes. Various gods in other cultures were often associated with chariots such as the Greek god Helios who’s chariot was the sun moving across the sky. Sometimes the elite were put to rest with a chariot, closest to divinity. The ships are believed to be symbols of rebirth. With them, the dead could travel to the other side which waited beyond death. 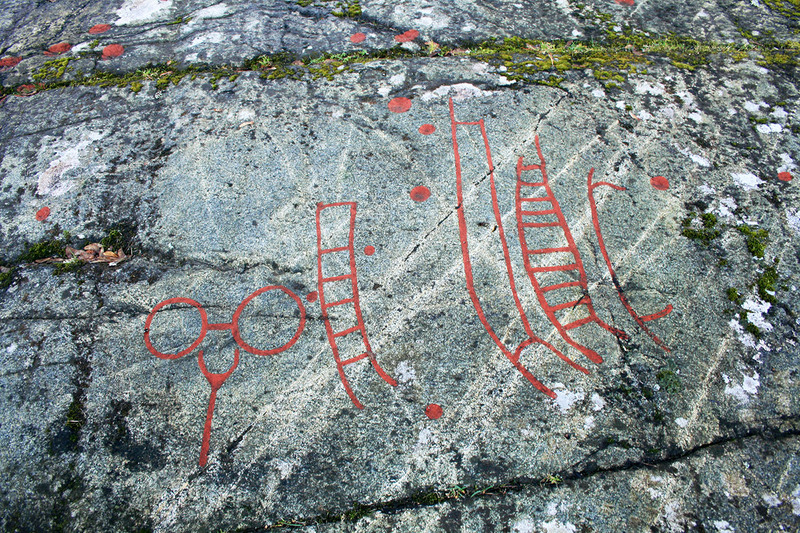 The cup marks (little red dots) here are scattered randomly, but they are also often found grouped into patterns. Cup marks were carved as far back as the stone age and are thought to be symbols of fertility, important to both hunters and farmers. Cup marks were used even to the beginning of the 1900’s where the locals could oil them (I think I’m translating that right) and put down coins to cure disease.